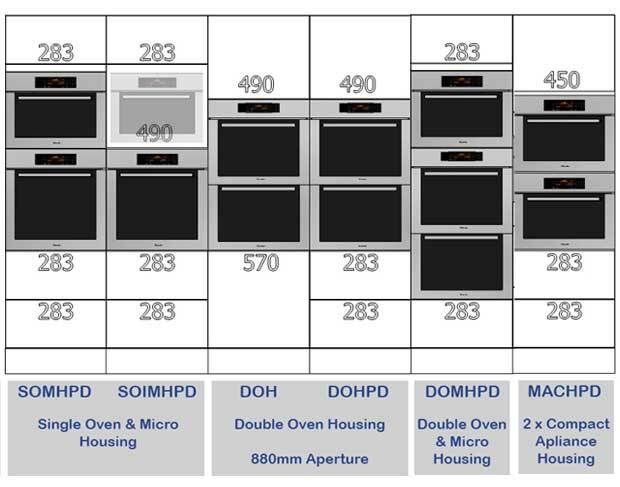 When deciding on which tall oven housing to choose from you need to think about exactly what you want to do with the rest of the unit. Are you going to have a single oven and a door at the bottom or a double oven with a few pull out drawers below or any one of the other options that we have available? Some people like their oven to line up perfectly with the worktop but you only get this effect if you have just the 1 single oven in a tall unit or if you have a compact appliance and/or a warming drawer. The numbers on the image below denote the door or filler sizes required to fill the apertures. If you have a double oven then it will drop below the level of the worktop due to the sheer size of the oven and to make it accessible. The same as having a single oven with microwave housing. 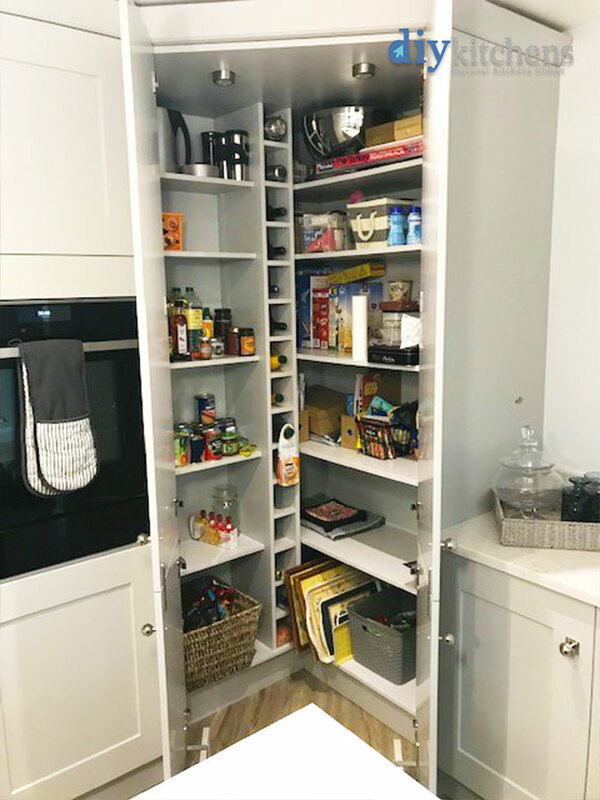 When designing a new kitchen, some people like the horizontal lines of pull out drawers to match any other pull out drawers in the kitchen run as shown below. This is not a necessity but required by some customers. Here is an example of a kitchen where the horizontal lines of the pan drawer do not line up with those of the drawers on the oven housing but as you can see, the kitchen still looks great! 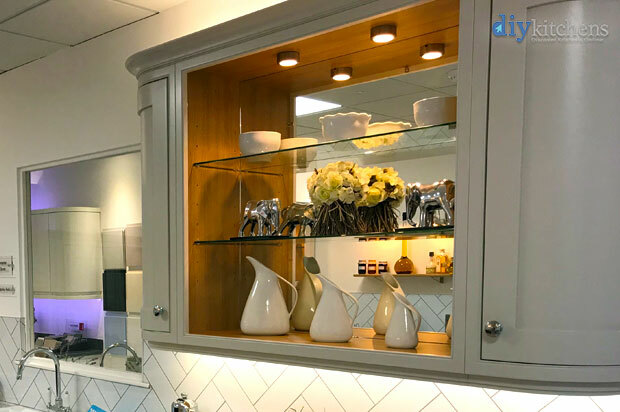 So, before you start planning your kitchen, have a think about all of the above (doors or drawers & lines) and you’ll get the look and feel that you are looking for. How do I line up a kitchen mantle? 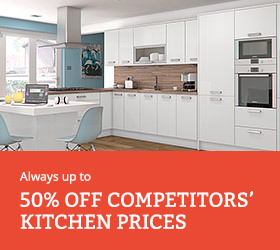 Will my dinner plates fit in your kitchen wall units? Hi Joanne, we have units in many different sizes/configurations and most require a filler panel above to cover any gaps. This needs to be cut down onsite with the correct chop saw for a smooth cut. Its not possible to change the door I’m afraid as the 490mm tall door is the only one that will fit this unit, so the door profile lines up with any adjacent units. But it didn’t come with a 490mm tall door the unit came with a 715mm door and a 570mm door so could I change the 570mm door to a 490mm door and get a better fit? Hi Joanne, you would be best talking with our technical sales team on 01977 608 418 and they will be able to tell you if this is possible or not. Hi, you have this unit SOHT2 – 2150MM X 600MM – BUILT-IN 2X SINGLE OVEN HOUSING – 1 PAN DRAWER. Can the pan drawer be removed and a plate warmer put in instead? Hi Paula, our factory would not be able to make this amendment, so it is something you would need to have your kitchen fitter do on site. You may also want to have the unit dry assembled to make it easier to adapt. 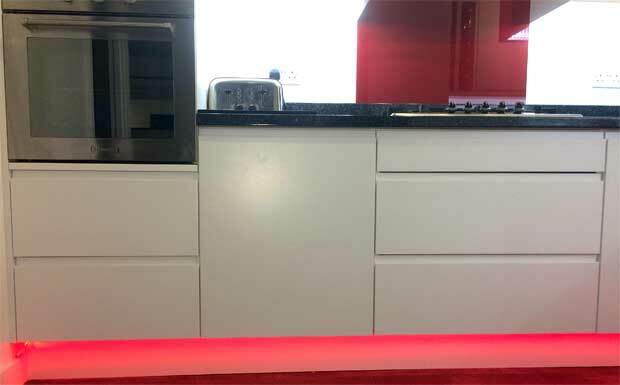 It is also worth noting that the bottom drawer is 283mm high, whilst the largest warming drawer is 240mm high, so you might need a filler panel too to cover any remaining gap. Hi I’m looking to have two tall units for my ovens. In order to get them looking correct is it possible to have 1 of the tall units housing a double oven and warming draw with the 2nd cabinet housing a single standard sized oven and a separate microwave? 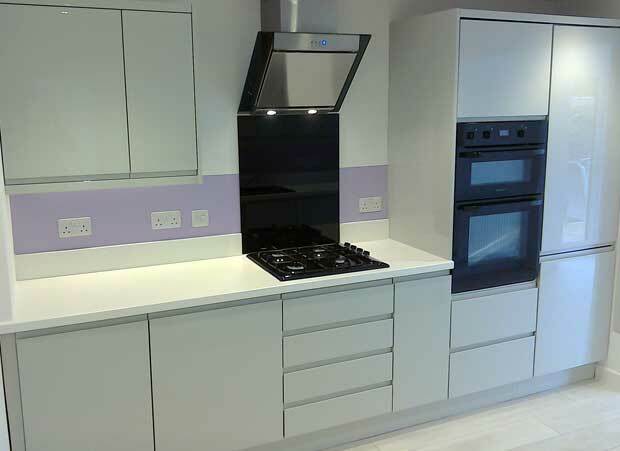 Hi Clive, we manufacture the items which you have mentioned – if you go into our tall units range you’ll see down the left hand side a list of different appliances and option to have inside of our tall units. We have two sizes for tall units, Here are the products codes for what your wanting in both sizes. 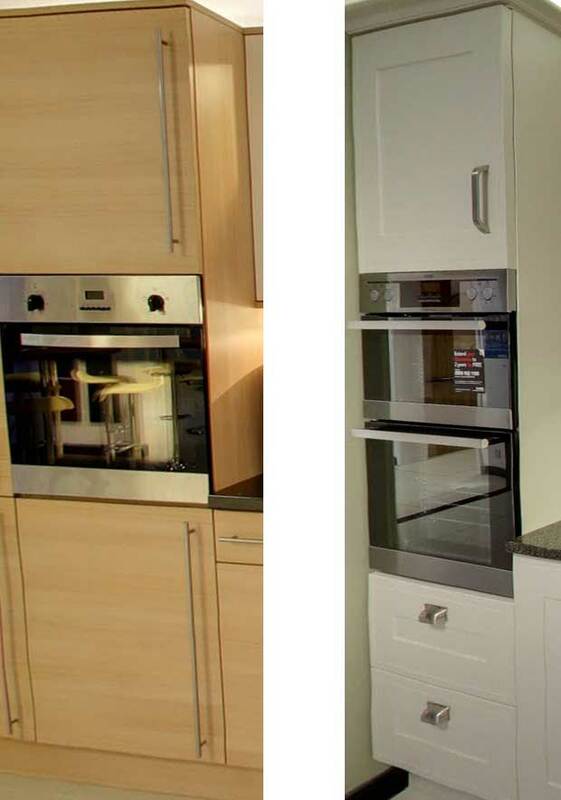 Single Standard Oven and Microwave housing we have a range of different options with the two different unit heights of 1970mm and 2150mm – please follow this link to see them. I have 2 tall units 2300 (single oven+ microwave), one with an Oven and Microwave and the other with a single oven, what can I use to fill the gap above the oven so that the appliances are aligned. There is no extra appliance that I want to specifically purchase. I don’t mind a warming drawer but that wont fill the space. You don’t appear to have a door that will fit to make the space useable. and I don’t want it left open as a shelf. Hi, the only way to do this would be to purchase the single oven and microwave housing and ask for this to be made bespoke with 2 x 283 pan drawers and a 895 top door and a 115 filler to be cut down on site. This will incur a cost of £100.00 as this is a bespoke unit and would need to go through the specials line. The 2 x ovens will start at the same height then. I’m using a SOMHPD tall housing for a oven and microwave . can the oven sit straight on top of the shelf or does there have to be a gap below it. For heat to escape. Hi, the oven would sit on the bottom shelf and then the microwave would sit above on the second shelf, they do not need any additional spacing for heat to escape etc. I’m planning a kitchen with a ceiling height of 2.4m but the area where I want to use two single oven tall units is unfortunately below a beam and has a maximum height in places of 2170mm. Do you have a tall oven unit that will fit? Hi, there are tall oven units below that measure 2120mm in height that should do the trick. Hi i am finishing the kitchen design and want the 2x pan draws on the tall double oven unit and tall microwave unit to line up with the base unit pan draws, will we require the 2+1 draws as we were originally thinking of the 2 + internal draw option. Hi, the bottom drawer on a housing with double oven and microwave is 283mm high. 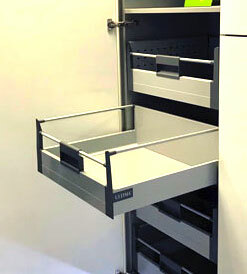 there is only one drawer and it will match the bottom drawer of the 2+1 drawer unit. 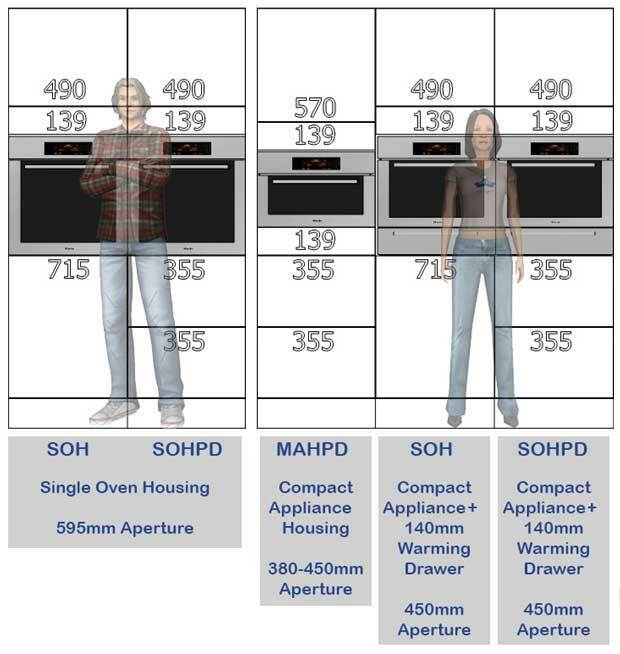 for safety reasons the double oven and microwave should not be raised higher than the original unit dimensions. What’s my best option for a 2150 unit to install 2x single ovens (stacked) and ideally have 1 pan drawer beneath? 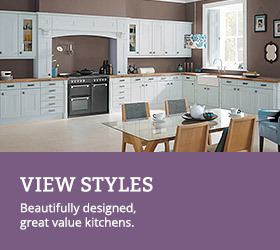 Hello, the SOHT2 doesn’t appear to be available in Helmsley bespoke or Ayton bespoke – the two kitchen styles I’m interested in. Is this correct? Can either of these kitchens have a 2x stacked single ovens tall unit created as a custom job? Hi Richard, if you send over a support ticket with your shopper ID, the sales team can add the unit in there for you, as this is not available on the website, although we are able to do this. Hi I have bought a mid height single oven from you. The oven housing is too low could I raise and put the filler panel in the bottom instead of the top. Hi, it is possible but you would need to remove the shelf and fit it higher and place the filler below the shelf. An easier option would be to order an appliance shelf from us and fit this higher than the original shelf to lift the oven and place the filler in between the two shelves. I am planning on a single oven, and integrated combination microwave oven, is the SOMHPD the correct unit? Hi, SOMHPD is the best one to use as you get 2 pull out drawers at the bottom for trays etc. I am building my kitchen and have ordered two “600mm Built In Single Oven And Microwave/Compact Appliance/Coffee Machine” – Total Height 2120 including 150 legs – units. I would like to have two single ovens, a microwave and a warming drawer(s). Is there any technical diagrams of these units that I can use to know what dimensions the appliances need to be? Hi, you will need 3 single oven housings as the Microwave/Compact Appliance/Coffee Machine and the 140 warming drawer add up to the same as a single oven. 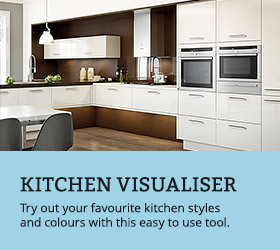 Hi, on your virtual showroom tour you have the Cento & Livorna kitchen on the upper floor. It shows a single oven in a tall unit (2120mm), with a door above it and a door below it. No filler is used above the oven, which I like. On your website however, the only tall unit that I can find that will house a single oven has to have a filler above it. Why is this? Is there something that I can do like order a bigger door for the cupboard above? The made to measure doors are now discontinued. 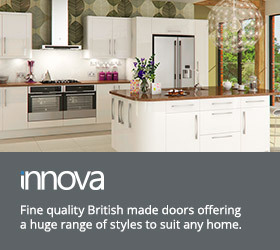 We now supply standard doors with a filler to accommodate all sizes of appliances. It also takes the door away from the heat source of the oven and prevents heat damage.